If you bring the items listed here, you will be in great shape at our jams. ​New ukulele pla﻿yer or jammer? Please click here, print this and try the items described before coming to a jam. StrumMn Jams - Songs in the Daily Ukulele: 365 Songs for Better Living (Yellow Book) or in the Daily Ukulele: Leap Year Edition (Blue Book) books. Both are available locally and online, including ebook versions. UkeAmericana Jams - Songs on the UkeAmericana or BUG Song Lists, in the Daily Ukulele: 365 Songs for Better Living (Yellow Book), in the Daily Ukulele: Leap Year Edition (Blue Book), or in the Favorite Old-Time Songs for Ukulele book. Most jammers print the BUG and UkeAmericana songs that are not in the Favorite Old-Time Songs for Ukulele or Yellow Books and put them in a three ring binder. Friday Morning Jams — Songs in the Daily Ukulele: 365 Songs for Better Living (Yellow Book), in the Daily Ukulele: Leap Year Edition (Blue Book), or in the Favorite Old-Time Songs for Ukulele book. These books are available at the jam site. BUZZ Sessions - For the BUZZ Song List, click here. Special Events - If we have a special event coming up, we may practice songs from the event song list for that event​. 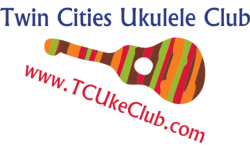 Never played a uke and want to get a head start - before the jam? Two great resources! The Daily Ukulele: 365 Songs F﻿or Better Living - Often just called ﻿the Yellow Book. Paperback and Kindle versions at Amazon. Click here an e-book digital version for your iPad. Basic "how to" instructions at the beginning. Paperback versions at Cadenza Music and Groth Music. THE BEST songbook for ukulele songs! The Complete What Ukulele Players Really Want To Know, available at Amazon. This is NOT a how to play or a song book, but has been called an 'owners manual for new players' - an answer to all those niggling questions that will hit you when you first start playing. Click here for a list of what to bring with to the jams.